You are here: Virgin Islands News Online » News » War of words: Walwyn lambasts Governor & Auditor General! The Education and Culture Minister, Mr Walwyn, who is also Co-Leader of Government, came out swinging against Mr Jaspert and Ms Webster, claiming that as recent as December 12, 2018—during a Cabinet meeting—he Walwyn, presented evidence to show there was no corruption in the ESHS wall project and that the Governor ignored the new information. 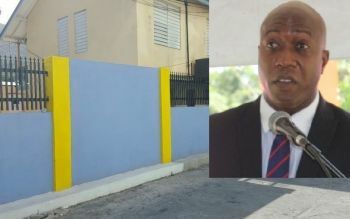 Mr Walwyn, following the bombshell AG report where Ms Webster concluded that taxpayers received, “No value for money, there was a violation of laws, and contractors getting paid for work not done”, said he got his own independent elevation done by BCQS and James Todman Construction that disputed the report. He also accused Governor Jaspert of political interference, “What is perhaps more significant, is the proposed timing of the statement. 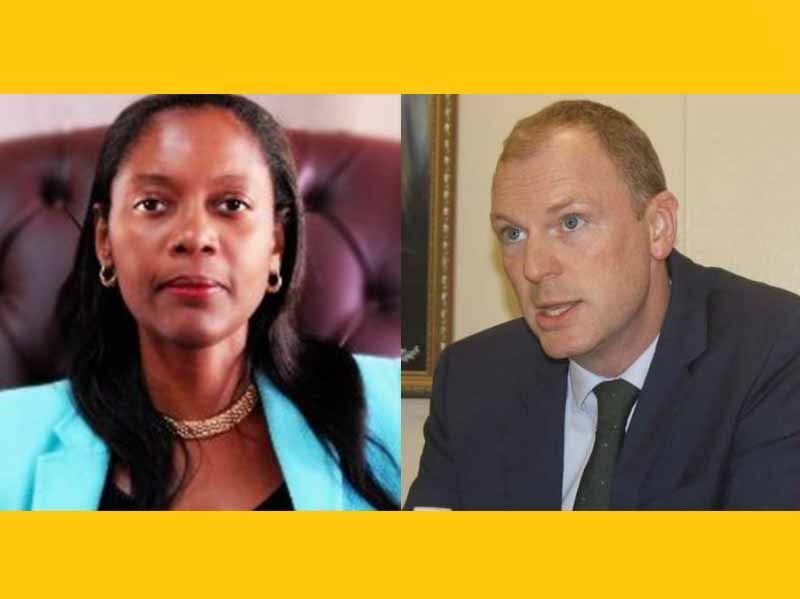 Elections are due within a few months and for a statement of this nature, without stating properly any allegations can prejudice the outcome of the elections,” Mr Walwyn asserted. “This action, in my view, prejudices any debate that will ensue on the matter. The House of Assembly is the appropriate place for the report to be ventilated, as the Members are the people’s representatives and can fully consider and debate the relevant issues,” he uttered. “I am in receipt of a memo from Public Works and also their evaluation of the cost of the wall which indicates that there was absolutely no consultation with them on this audit exercise,” he said. Police Commissioner Michael B. Mathews has already confirmed that he has the audit report in hand and many legal experts note, that the next step after the Police probe, would be to recommend criminal charges to the Director of Public Prosecution if there is a cause. Hon walywin keep pressing, we got you! Myron will say anything to get himself out of trouble and to get re-elected. he’s a good manipulator and a BULLY.. I must admit Myron is a GOOD MANIPULATOR!! Chickens coming home to roast. But being who he is, he’ll like prison. Well then the Gov should be made to apologize as Hon Walwyn had to for pre-empting the process. Anyway.this is what I will say, when you make accusations also make sure you have supported evidence to validate your claims otherwise you could look inept. No election interference here. The Governor is fulfilling his responsibilities, as the MEC is his, and letting the chips fall where they may. If the Gov had delayed forwarding the report to the RVIPF for investigation after 16 April 2019 and violations were unearthed, the Opposition probably could have accused the Gov of playing politics. The Gov was between a rock stone and a hard place and used his judgement. Further, if the MEC did nothing wrong and everything was above board, why not let the RVIPF conduct its investigation? Why lambast the AG and Gov if the MEC did nothing wrong? Would the AG and Gov be wonderful people if diffrent findings were arrived at and no referral was made to the RVIPF? Moreover, before we lash out at agencies, would it not be better to exercise some discipline and let the process(s) play out. Why burn bridges before the facts come out? Is this lashing out at the AG, Gov...etc an attempt to taint the investigation and preparing base to doubt the fairness of the processes? As an attorney, the MEC knows that in some cases no defence is needed if the other side had no evidence, facts. Sometimes silence is golden. I hope that Myron recognize that this is a serious matter and it appears he is trying to interfere with justice. Let justice have its course. We have a good strong justice system. Please Stop from undermining trying to it. Myrun is outa place! He should be fired for his actions. Mitch did say he can do what he feels & there’s no action against him. Bows the time, but, we’ll have to await the report to see if he ends up in the very prison he oversees!! Myron needs to move his ***, this man always feel that what he come to people and say is gospel and we must accept it no matter what. Am really surprised at your actions as a lawyer. The Governor is fulfilling his civic duty and doing what is right and proper. How dear you accusing the Governor of political interference. You speech and actions tantermount to utter disrespect and unbecoming of the office you holds. Shame on you Myron. Why the honourable minister now sees it fit to indicate that the standing orders should determine what took place now that the HoA have started the debate on the issue? Didn't the minister knowing was wrong when he made a pre-emptive strike by disclosing the report before it went before the HoA? The best form of defence is to attack and I believe what the minister is doing is trying to muddy the water and let it appears as if everybody is against him and he did nothing wrong. He need to just sit down and let due process takes place. Once the police have the report I firmly believe that some level of criminality was found and hence the police after their investigation will let the DPP makes a ruling. This is going to be a bumpy ride so sit back relax and wait for whatever is to come. I am sure the DPP will get the file before General election. Well, you do the math: $1.6 million for a wall built by something like 60 contractors (so about $26,000 each), portions of which did not survive the storms. Why 60 contractors to build it? Was there a even a spec? or, an engineers estimate? I found the actions of the Minister of Education to be very unprofessional. The Governor presented the report of the Auditor General and it was laid in the House of Assembly. There is absolutely nothing wrong with that. The minister was very disrespectful to lambasted the Governor and the AG. This is a matter that he should have left for the Minister of Communication and Works to handle and slip out of the wed. Myron has put himself into the lion's den and only God can save him as he did with Daniel. He must remember that you don not mess with the British. Lets wait and see. Wait till ayu hear wa else went on in that school with ppl salary. First Myron aint no lawyer. Just have a law degrer. Second : "he Walwyn, presented evidence to show there was no corruption in the ESHS wall project and that the Governor ignored the new information. Bringing "new evidence agter the fact doesnt scire any points on Myron's favour. That's a Clown move. This is a self-inflicted chest wound. The MEC could have managed the outcome, for all it had to do was to strictly follow the in place construction procurement process. It didn’t and things went awry. Politics infected what should have been a simple, straight forward project. Instead of being a simple construction project, it was a political project. Some 70 contractors on a small construction project. Wow! With so many contractors, how do you effectively manage the project? No wonder things went off the rail. The Auditor General and Governor are just messengers. Don’t shoot the messengers. Let the RVIPF conduct the investigation and if there is nothing to see, there is nothing to see. The MEC should welcome the transparency if there is nothing to hide. The olde people say when you fling a rock after a pack of dogs, the one that gets hit hallow. Ah yu know that sound. Moreover, it is an open secret that government pays more for goods and services than it should. The taxpayers are raped blind. As such, the estimated inflated prices that contractors come up with are not the market rate; they are what government is willing to pay without question. If the money was coming out of individual pocket, there would be some serious concern (they would be screaming from the mountain top). Taxpayers are not paying fair and reasonable prices for goods and services; they are consistently ripped off; they are not getting value for money. The inflated prices, lack of due diligence, lack of value for money........etc are a key factor why the cost of governing is ballooning and skyrocketing. Who is looking out for the taxpayer? Apparently, no one. WANTED: A government that will look out for taxpayers interest. A government that will exercise fiduciary responsibility. A government that will employ exemplary stewardship of limited and scarce resources. A government that is committed to good governance: transparency, accountability and responsibility. A government with a leader that will run a no nonsense, professional, tight ship on ministries and the people’s affairs. Which party can meet the criteria, ie, PUP, PVIM, NDP, UP, VIP or a coalition. Fellow Virgin Islanders, we get the government we let run wild. If we want better governance, we must get agitated, get engaged.......etc. We (masses) have the power; the many, not the few, must rule. Don’t give up the power for a bowl of porridge. We cannot let political and economical patronage ruin the BVI; it is in the incipient stage so let’s arrest this poison. I pray for this right here, well said Diaspora! YOU JUST HAVE TO LEARN TO SHUT UP FOR ONCE. YOU THINK BY GOING ON THIS WAY THE REPORT WILL LEAVE THE POLICE? LASHING OUT AT THE GOVERNOR AND AUDITOR MEANS WHAT, THE COURSE GOING CHANGE? STOP TRYING TO JUSTIFY BAD BEHAVIOR, YOU LIKE MARK AND PIER PARK - SOON COME, ALWAYS UP FRONT TRYING TO JUSTIFY WHAT WE ALL KNOW. JUST RELAX AND LET THEM INVESTIGATE AND IF YOU INNOCENT THEY WILL FIND THAT. IF YOU GUILTY THEN YOU KNOW PUNKIN WAITING ON YOU. SO JUST SHUT UP AND ACT LEADERSHIPISH.